What Makes Chi Omega Special? On April 5, 1895, four young women, with the help of a local dentist, founded Chi Omega at the University of Arkansas. Today, Chi Omega has grown into the largest women's fraternal organization in the world with over 330,000 initiates, 178 collegiate chapters, and more than 250 alumnae chapters. In 1922, twelve enthusiastic University of Arizona women formed a local sorority called Chi Delta Phi. Under the guidance of Mrs. G.M. Butler, they set Chi Omega as their national sorority goal. Then, on December 11, 1922, Chi Delta Phi was installed as the Zeta Beta Chapter of Chi Omega -- the 62nd official Chi O chapter in the nation! To learn more about our organization and all of our wonderful chapters across the country, please visit our National's website at www.chiomega.com! Zeta Beta Sisterhood. There's Nothing Like It. My name is Abby and if you are on this website, you are probably wondering what is Chi Omega? Why would I join a sorority? Why would I want to be a part of one of the largest all girl organizations? Well I hope by reading my sisters’ statements on this website has given you just an idea of the love, empowerment, and encouraging environment that Chi Omega brings to one’s life. As I’m writing this, I am currently heading into my final year as an active member of Chi Omega, and I cannot even describe to you the overwhelming amount of emotions that come with just two words. I never in a million years would have thought that I would join a sorority, but my older sister believed that this would help me in ways she never could. She told me that this will be a bond you will have with people for the rest of your life. Those words stuck with me as I chose Chi Omega three years ago. From that point on, I have been grateful to have such a wonderful college experience because of Chi O. Honestly, I could spend my time telling you millions of stories, but I’d rather share my uttermost gratitude toward the best three, soon to be four years, of my life. To my absolute best friends and sorority sisters: I am lucky to have found the ones who make me laugh for hours on end, making me forget that I have a final in less than an hour. I found the people who just get me, and know that I need a snack size Oreo McFlurry, Taco Bell quesadilla, or a drive around campus with the windows down screaming our favorite throwback songs. And truly, as cheesy as it sounds, I found the people that have made me want to be a better, friend, student, daughter, sister, volunteer, worker, and individual to the Tucson community. Thank you for the trips, the hilarious talents you all showed so confidently in our annual talent shows. Thank you to the classes above my PC, showing the bonds and the strong connections you could make within your own class, as well as, every individual in the house regardless of age. 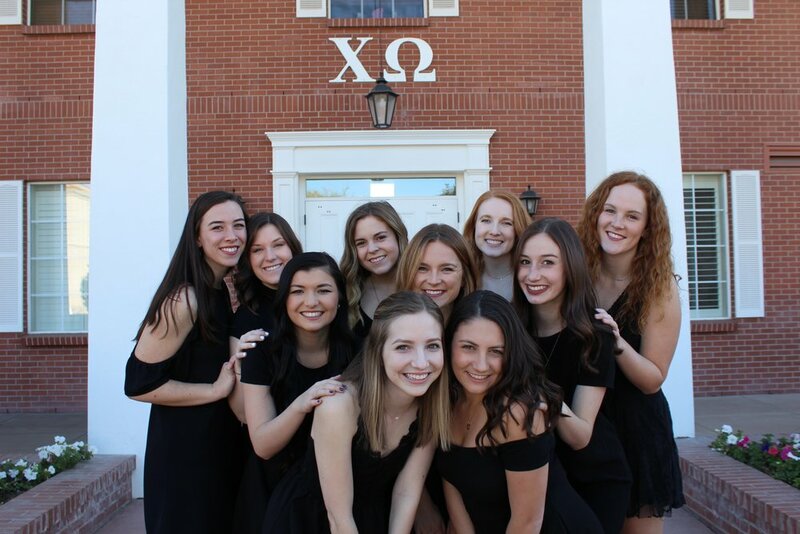 Without a doubt, Chi Omega has brought me to my people, who will love me on end, live with me to the fullest, and push me to continue finding myself as I continue on after my time at the U of A. Finally, to my dearest Chi Omega, I will always have endless gratitude for you. Behind the beautiful house, you bring real, authentic woman in with welcoming arms. You believed in us, provided us strength, gave us love through the rollercoaster of life. You have shown me how to be committed, driven, and passionate in all aspects of my world. You have given me the confidence to walk independently, and yet, lean on my sisters for their support and friendship when the going gets tough. You have instilled values in me along the way as I would stumble through the back doors as a freshman and now walk confidently out the front door as a senior. Here’s to you, here’s to my sisters, and here’s to Chi O for standing by all woman and gracefully guiding them into the future. serve the world while keeping Chi Omega ever at heart"